Finest tea trolly caster available in America. 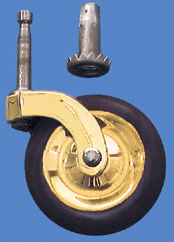 Solid brass center with rubber wheel. Steel stem and insert. 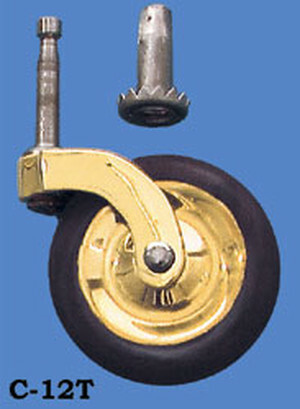 Comes complete with steel sleeve, but many times these casters will snap into the old sleeves still in old furniture. If you're tired of your casters scratching your wooden floors, change to this gentler model. If you're matching older hardware, select the "antique" finish. Wheel Dimensions: 2 ½" diameter x ½" wide. Steel Stem: 1 ½" tall x 3⁄16" - 5⁄16" diameter. Steel Sleeve/Socket: ~ 1 ¼" tall x ¾" (toothed bottom) - 5⁄16" (narrowest) wide.